The most current naming opportunity is for the Stanley Family Allee. Please click here for more information from Stanley's website. The proposed Stanley Allee borders the brick sidewalks featuring a large sod area, with 10 allee elms and 8 light poles. Beautiful area perfect for concerts, weddings, parties and family reunions! $25,000 will secure this naming opportunity for the Stanley family. 2 granite bands naming the Stanley Allee will proudly be installed after the funding is raised. The goal is to raise the required funding over the next 2 years - ending in October 2015. The National Stanley Family Association has approved $2500 for the Allee if matching funds are raised. This can be accomplish by purchasing a brick that you have personalized or by a donation specifying the Stanley Allee. There are 2 sizes of bricks. $220 for 8" x 8" red brick and $120 for 4" x 8". Click here for the Brick Order Form. Please consider this endeavor that will keep the Stanley name in history forever. Your support is a tax donation as allowed by law. 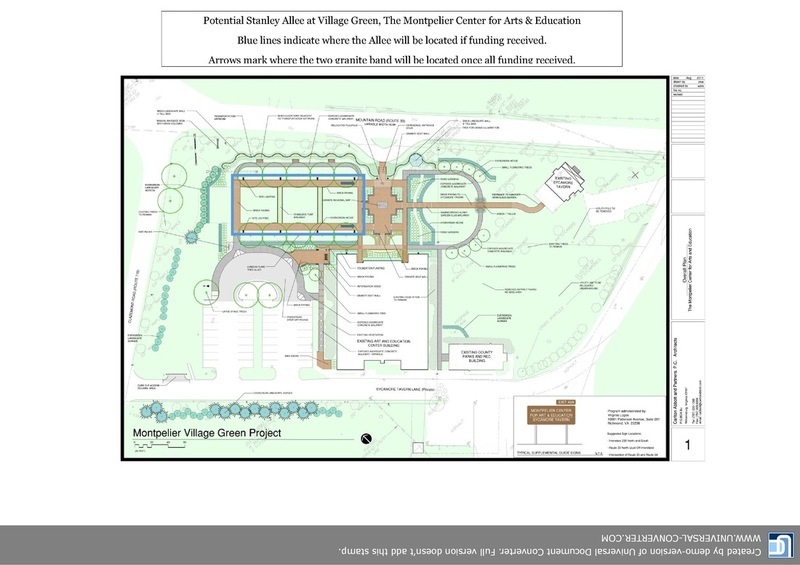 Any questions, contact Kelly Waldrop, Executive Director of the Montpelier Center at 804-883-7378.